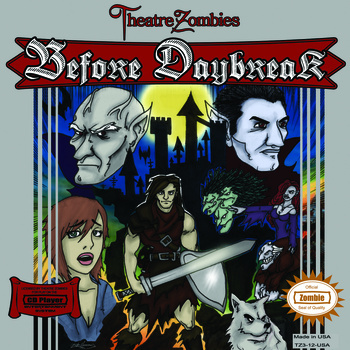 The Theatre Zombies really came out swinging with their 2012 release, Before Daybreak. From start to finish the music comes at you at a perfectly fast pace and never lets up for its entire duration. The first thing I must comment on is the vocals. As I have stated in past reviews, one of the problems any fan of the horrorpunk genre can encounter is the amount of bands who feel it is necessary to rip Danzig-style vocals. While I definitely think there is a place for that, I do personally find myself more taken by the bands who attempt to forge their own identity. The Theatre Zombies exceed in this aspect. We are given fantastically clean vocals which are incredibly catchy and sing along worthy. The only real downside to the album is many of the songs begin to sound alike, but this also plays to the strength of the album when listened to in one sitting. It almost becomes like you are listening to one epically long horrorpunk song, and I mean this in the best way possible. The album kicks off with The House Of Lee which introduces you to the bands sound and sets the stage for what is to come. As the album continues hitting upon different topics such as the lament of being a vampire, as well as an ode to The Crate segment from Creepshow, it continually moves along at a breakneck pace. Then it comes to what is far and away my favorite song on the album, as well as one of my favorite songs ever, the fantastic What We’ve Become. Coincidentally it is the song that changes up the tempo of the album to begin, before getting back up to speed with the rest of the album. It takes on the real life horror of what a relationship can do to one, while adapting it to our beloved genre. Seriously, if you can listen to this song and not be bobbing your head and singing along, I daresay you may have no soul. The album never hits the high of What We’ve Become again, but it can’t be expected to. What it does do though, is keep up that relentless pace as it smashes through the rest of the track listing. A late album highlight is Planet Of The Dead, another tune with a great catchy sing along chorus. And no review of this fine album would be complete without commenting on something usually very overlooked in the genre, the album cover art. The band have created an epic ode to Castlevania by recreating the original game’s box art, and making it their own. I am not lying in any way when I say it is one of my absolute favorite album covers of all-time. It retains an air of simplicity while also just being awesome. If you want to check out more of The Theatre Zombies, you can find both this album and their prior album, The Midnight Run at their Bandcamp page. You can also check them out on Facebook.